The disc brake pads and disc brake rotors fitted to your bike play a significant role in braking power, modulation, and reliability. The pads supplied with your bike on purchase will only last around 5000 kilometres at most, so there comes a time when you will be shopping for after-market disc pads and considering replacing the disc rotors. In this 'Workshop Focus' post, I look at the things to consider in this selection. Disc brakes use a caliper mounted near the dropouts of the frame or fork of a bicycle. Two pads are housed inside the caliper, and pistons force these onto the rotating rotor; the resulting friction is what slows and stops the wheel. Pistons can be cable actuated or hydraulic powered. 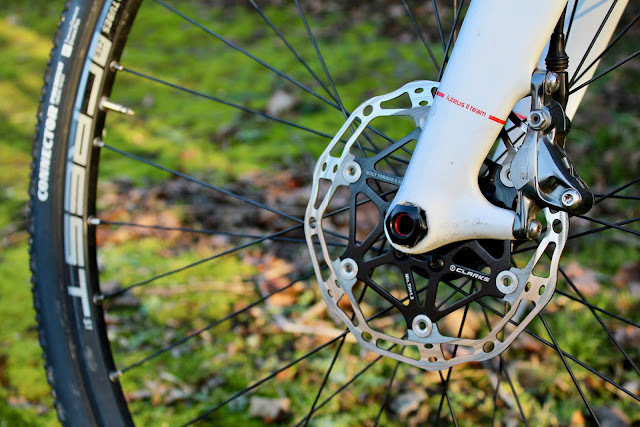 For a disc brake to be effective, the friction between the pad and the rotor needs to be strong enough; this is negatively affected by contaminants like grit, oil and mud — so it is vital to remove these to ensure consistent braking performance, and to avoid disc brake noise and squeal. The effectiveness of the pads and rotors also depends on the compound of the pad. Disc pads come in two varieties: Sintered and Resin/Organic. 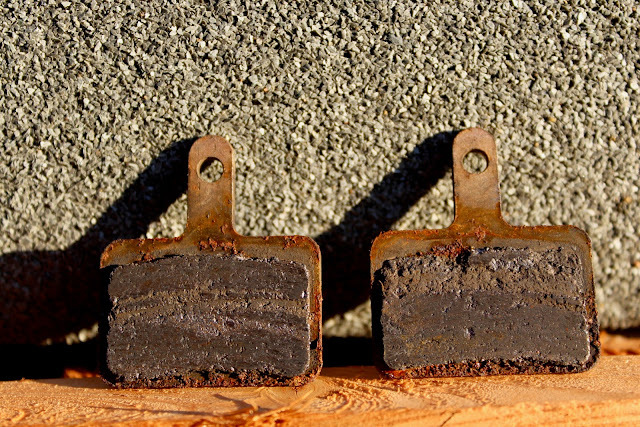 Sintered pads contain small pieces of metal, which make the pads harder wearing, but also harsher on the rotor. Organic/Resin pads are a softer compound, which is faster to wear out, but provides more effective braking friction and stopping power. The pad you choose will depend on the longevity you require, and the conditions that you ride in. The condition of the disc brake rotor also plays a significant factor in braking performance. Over time a rotor wears down and becomes stepped between the area of brake pad contact and the inner circle of the rotor. This stepping causes an uneven contact for the pad and is a primary cause of poor braking and disc brake squeal. When replacing a rotor, it is necessary to consider the compatibility with the disc brake pad. Some brands will also not allow the use of third-party rotors or pads with their disc brakes and doing so voids the warranty. I have worn through more brake pads than I can count, and have binned more disc rotors than I care to imagine. The experience has taught me what to look for when choosing after-market disc brake pads and rotors. 1) Riding Conditions and Disciplines — I ride a lot of miles (check out my 2018 stats), and most often those miles are on a gravel/cyclocross bike, or on a fully loaded touring bike. 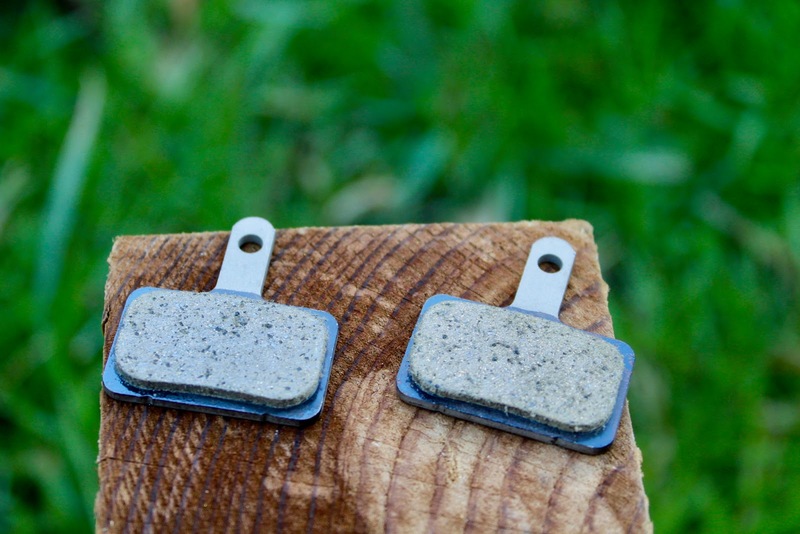 The conditions encountered in both disciplines are hard on brake pads, and so to get good longevity I tend to opt for sintered metallic pads for my bikes. If I lived in sunny Spain or California, then I would opt for resin pads. 2) Pad Quality — I have tried everything from super expensive SwissStop pads to cheap unbranded pads on my bikes. My verdict is that for sintered pads at least, the best option is to find a middle-ground pad that has much of the braking performance of the most expensive pads, but without the strain on your wallet when you do eventually have to replace them (which you will, regardless of how much you spend). My choice for winter 2019 is the Clarks VRX Sintered Disc Pad — it provides great stopping performance, and good longevity. Unlike cheap unbranded pads, I have seen no sign of the pad delaminating from the metal backing plate over time, and no sign of the metal backing plate or pad rusting with the winter onslaught of grit and road salt. The Clarks VRX are a reliable choice, without being too highly priced. 3) Rotor Selection — Choosing the right disc brake rotors is also a consideration when upgrading or overhauling your brake system. From my experience there is little to be gained by shelling out on expensive Shimano IceTech Rotors, as they seem to wear just as quickly (sometimes more so) and tend to be difficult to clean. I have recently been opting for Clarks Floating Rotors, which are one of the best value offerings on the market. The floating nature means the braking track area is separated from the inner rotor, allowing the manufacturer to make the inner area from lighter weight aluminium alloy, with the outer area made from more wear-resistant stainless steel (this is how the Clarks rotors are composed); it means that the floating rotor is less susceptible to warping and deforming under extreme heat than a standard one-piece rotor. Regularly checking your bike's disc pads and rotors for wear, contaminants, and misalignment is a good way to ensure consistent and reliable braking performance. Replacing worn or damaged parts is not only a benefit to your performance, but also a safety consideration. Hopefully the above advice will help you if you are riding through the winter, and in need of replacement disc brake parts to keep you stopping safely.